Nothing shows that the body discovered by Iwacu was that of journalist Jean Bigirimana. We will soon be well-informed. But whoever he is, he deserves to be buried. That citizen who was killed, thrown away and forgotten; whoever he is, he deserves a proper burial. After three consecutive days of investigations on Friday, Saturday and Sunday, Iwacu journalists finally found a body in the area where our colleague who might have been killed is supposed to have been thrown. I would first like to express my respect to the CNIDH for their continued active involvement in search for our missing colleague. Friday, August 6, Iwacu journalists were alone at the scene. Saturday, August 7, the Muramvya prosecutor, policemen, intelligence service (SNR) agents and CNIDH were on the field alongside Iwacu journalists who had returned there to pursue their investigations. Certainly, it’s a little bit strange that, with all the means and capabilities at their disposal, security forces came to follow the leads found by mere journalists. No wonder this “joint” research yielded nothing. But we appreciate it anyway. 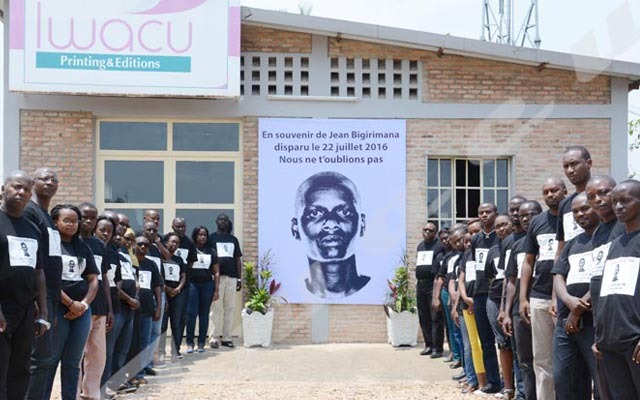 On Sunday, Iwacu journalists returned alone on the ground and discovered a body in the area where journalist Jean Bigirimana reportedly went missing. Is that the body of our colleague? We cannot know for sure. The place is difficult to access and journalists do not have the adequate means to identify the dead body. The task of identifying the corpse is the responsibility of the CNIDH and police. If necessary, Iwacu journalists are ready to help both institutions and show them the place from this Monday. Anyone can understand why the identification of that body is particularly important. At the time of writing, we do not know, therefore, whether the body rotting in the Mubarazi River is that of our colleague. Once the body is brought from that valley, where it is at the mercy of scavengers, we will identify it.